There seemed to be a degree of resignation surrounding the draw for the first knockout round of the Champions League this season, at least in North London and in Bavaria. Whilst there is a sense of familiarity in this tie, though, it should be noted that this is a very different Bayern side under the influence of Italian coach Carlo Ancelotti as opposed to the Spaniard Pep Guardiola. Ancelotti is known as more of a motivator of players rather than a tactician. With that said however the majority of this Bayern side played under Guardiola for three seasons and retain all of the tactical knowledge passed over by their old coach. Whilst the German side are still not to be underestimated, they are nothing like the attacking whirlwind that Arsenal have encountered in recent seasons. The same can be said of Arsenal, who have blown hot and cold in recent weeks with the fans becoming more and more restless at the prospect of long serving manager Arsene Wenger staying on for a further term given the lack of recent progress. Arsenal started the match with the Colombian goalkeeper David Ospina taking the place of Peter Cech in goal. Hector Bellerin and Kieran Gibbs played in the fullback positions with Mustafi and Koscielny in the centre of the defence. In midfield Arsenal started with a relatively deep double pivot of Granit Xhaka and Francis Coquelin. Mesut Ozil started as the number ten with Alex Iwobi on the left and Alex Oxlade-Chamberlain on the right. Alexis Sanchez started as the lone striker. Bayern lined up with their strongest possible side. Manuel Neuer in goal. Phillip Lahm, David Alaba, Javi Martinez and Mats Hummels in the defensive line. Arturo Vidal and Xabi Alonso in midfield with Arjen Robben, Douglas Costa and Thiago playing behind the Polish international striker Robert Lewandowski. Under Pep Guardiola one of the most common tactical mechanisms that we saw from Bayern was the way that they overloaded certain zones of the field in the final third. They would mass an attack and try to play through the oppositions defensive line before looking to switch quickly to the underload on the opposite side should the opposition hold firm. This mechanism allowed Bayern to constantly keep the opposition defensive structure from becoming set by moving them quickly from side to side and constantly asking different questions. 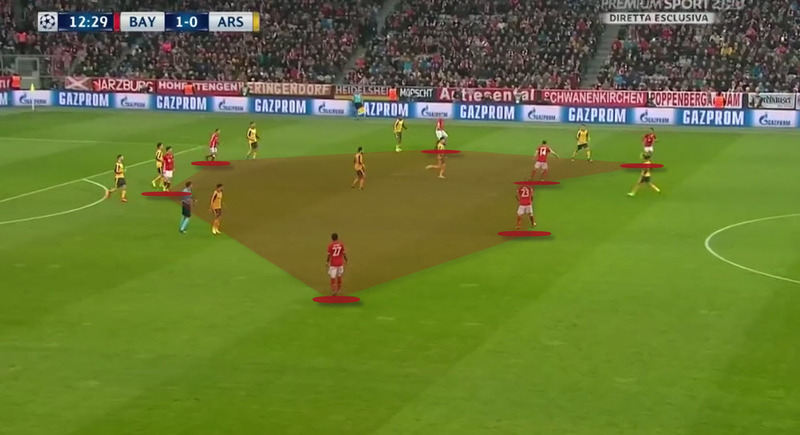 We saw this again in this match as Bayern constantly looked to overload in the attacking phase and to press in an overloaded zone when Arsenal tried to build an attack. This made it extremely difficult for Arsenal to enjoy any kind of prolonged possession of the ball. In this image we can see that seven Bayern players have overloaded the left hand side of the pitch as they look to penetrate behind the Arsenal defence. It is interesting to note that one of these seven players is actually the Austrian international David Alaba who has moved in to a central position from the left back slot. These Bayern players are occupying nine Arsenal players immediately and even though the defensive structure for Arsenal looks to be set there will be an underload on the opposite side that Bayern can look to access with a quick switch. This time Arsenal are in possession of the ball in their own half as they look to transition in to an attacking phase. There are two players immediately positioned to press the man on the ball whilst the easy passing options for the man in possession are covered by close marking. Arjen Robben has tucked in from the right hand side and is positioned centrally to offer a sense of protection should Arsenal be able to play through the structure. With the pass back to the goalkeeper also covered the man in possession will be forced to play the ball long out of the press giving Bayern a chance to win the ball back immediately. Another of the tactical tweaks that we saw from Bayern under Guardiola was the use of four or even five man attacking lines situationally to quickly overcome their opponents. This match showed that Carlo Ancelotti is content to follow some aspects of that game plan. There were several times in the match that Thiago drifted forward in to the advanced positions to create a four man attacking line against Arsenal. This meant that there was little in the way of immediate support for either fullback or the centre back that was marking the zone occupied by Lewandowski. The lack of defensive work rate from Mesut Ozil from Arsenal negated the possibility of Arsenal matching up with the Bayern midfield man to man and created this situation with the four on four line. On this occasion Lewandowski has dropped in towards the goal with Thiago taking up a position to the right of him. The Arsenal defensive line is set but currently caught with nobody to immediately mark. Instead the Bayern attacking line is positioned on the Arsenal midfield with space to move in to between the two lines as the opportunity presents itself. David Alaba has carried the ball centrally and has the quality to play through and in to space as the Bayern attackers shift and move ahead of them. In this example Thiago has again moved away from the midfield structure to join Lewandowski in attack. Note his position above though. He has found a large pocket of space on the blind side of both the two central defenders and the two shielding midfielders who look to press the man in possession. As the attack progresses Thiago will drift across the front line in space to link in to the ball as it is played through the Arsenal defensive lines. For the whole match Arsenal struggled to get to grips with the movement and intelligence of the Spanish international. Usually when I write an analysis article based on a particular match I can at least identify some positive traits from both sides and there is usually an underlying game plan that is evident from the match. I simply could not see what Arsenal were trying to achieve in this match whether in the defensive or attacking phases. This action led to a Bayern goal. Just look at the defensive structure from Arsenal. Look at the spacing between players in the defensive lines. To allow a team with the quality of Bayern to have possession under no pressure in this instance and to not be solid structurally is just inviting trouble. Xabi Alonso simply plays through the lines to Lewandowski who pivots on the ball and slips it in to Thiago who has all but meandered through the space in the defensive line for an easy goal. There were some points in the game in which the decision making from the Arsenal players was simply terrible. This is the moment before Bayern won back possession of the ball to score their fifth goal. The man in possession has taken the ball from Ospina as he passes the ball out from the back. There is one glaring passing option open which I have marked but instead the man with the ball hesitates and is quickly dispossed as Bayern counter press and win the ball back. At 5-1 down from the first leg I think that it is fair to say that the tie is over. Arsenal fans are right to be concerned regarding the path that their club is going down at the moment with the apparent lack of true ambition or drive. Will Arsene Wenger prove us all wrong by changing system and structure to overcome Bayern at home? If he does so and if he shows that he can adapt, then he should certainly be afforded more time. If not however then the Arsenal board may have to truly examine what they want for the club going forwards.